The Japan-America Society of New Hampshire (JASNH) is a non-profit, nonpolitical organization with a membership of individuals and businesses, both American and Japanese. The Society's primary purpose is to further mutual understanding between the peoples of New Hampshire and Japan -- each other's society, history, economy and culture -- and to promote the US-Japan relationship in general. 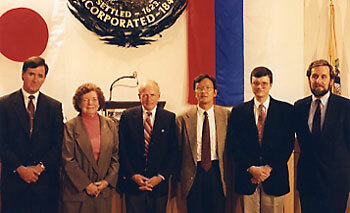 Founded in 1988, the Japan-America Society of New Hampshire sponsors educational, cultural and public affairs programs, as well as programs of studies and exchanges undertaken by the members and the general public. The Japan-America Society of New Hampshire offers members the opportunity to participate in additional events organized to commemorate the Portsmouth Peace Treaty and to explore its themes. 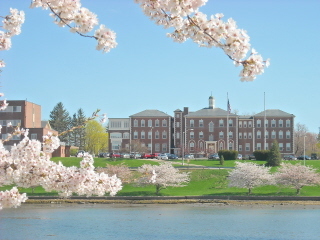 Each year the Japan-America Society of New Hampshire celebrates the Cherry Trees that are descended from the iconic Washington DC cherry trees that were given to the US by Japan in thanks for our help in the Russo-Japanese War -- the diplomacy that resulted in the Portsmouth Peace Treaty. We invite you to participate in these events and discoveries and to support the Society's work by becoming a member of the Japan-America Society of New Hampshire. For the online membership application, click here. To share the 3SArtspace/JASNH PechaKucha #19 invitation on Facebook, click here.